On September 23rd, Google officially announced that Penguin 4.0 has finally arrived. It’s been nearly two years since the last Penguin update, so needless to say this is exciting news for sites that have been waiting to recover from previous iterations. When Penguin first rolled out in 2012, many businesses took a big hit, since they didn’t have the budgets or resources to make the improvements necessary to see a recovery. Keep in mind, most of these businesses hired fly-by-night SEO agencies, and had no idea what types of tactics were being used to improve their rankings, nor were they aware of which SEO practices violated Google’s Webmaster Guidelines. For boot-strapped small business owners that relied on Google as a steady source of free traffic, Penguin was a direct threat to their livelihood. Then to add insult to injury, four years later, many of the victims have yet to see a full recovery. Many didn’t take action because they simply didn’t know that Penguin was to blame for the drop in traffic. In this post, I’ll discuss a few things business owners should know about Penguin 4.0, and what to expect from Google going forward. In the past, when a site was affected by Penguin, site owners would sift through their backlink profile, disavow any questionable links, and wait patiently for a refresh, which typically took months and sometimes years to happen. Although it took 707 days for the latest iteration to roll out, Google’s Gary Illyes says he feels it was worth the wait. Another major improvement is that Penguin now penalizes specific pages and urls, rather than the website itself. In the past, a Penguin penalty was site-wide, meaning that if Google detected a large number of untrustworthy links to your site, then your entire site would be penalized. Instead Google will issue penalties on a more granular basis, however, impacts are not only limited to pages. On September 28th, Barry Schwartz reported on Search Engine Roundtable that Google would no longer be demoting links, but instead devaluing them. When Google demotes a link, it means that rankings are negatively impacted – this is how so many sites were hurt by previous Penguin updates. When Google devalues a link, it just means that link is ignored, and has no positive or negative impact on rankings. In my opinion, this is a much fairer method of evaluating links. Keep in mind that in order for Penguin 4.0 to fully roll out globally, Google needs to first re-crawl and index the entire web. Suffice it to say that it will take some time for the dust to settle. 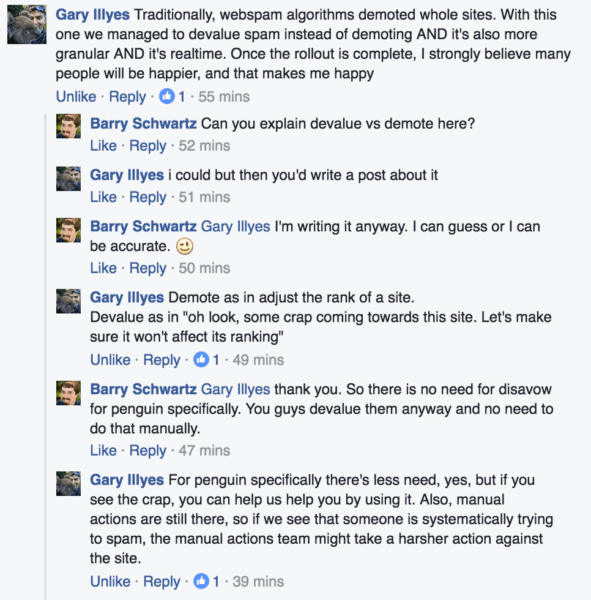 In fact, Gary Illyes said that “parts” of the Penguin update may have rolled out prior to September 23rd (when Google first made the official announcement). The good news is that recoveries for sites hit by Penguin 3.0 are starting roll out now as well. @methode Thanks! Has this happened yet? i.e. have penalties from Penguin 3 all been removed? If your site was hit by Penguin 3.0 back in 2014, you could see a recovery over the next few days. As I mentioned, Google is now reversing link demotions, and simply devaluing the spam, so anyone who has seen negative impacts due to Penguin, could start seeing some improvements. Recovery mostly depends on what you’ve done to clean up your backlink profile, and how often your site is crawled by Google. If your site was hit by Penguin in the past, it’s important to understand that you may never restore your pre-Penguin rankings. For starters, although you won’t be penalized for the spammy links anymore, they also won’t be counted in your favor, so any value they were providing before won’t help you post-recovery. You also need to account other sites that may fluctuate, which could move you up or down in search results, depending on where your competitors stand after the roll out is complete. Also, Penguin is just one of over 200 signals that Google uses to rank websites in search results. You shouldn’t have to worry about protecting your site from negative SEO, since the links technically can’t hurt you. But it’s still a good idea to keep tabs on your backlink profile, and you can still use the disavow tool for any links that appear questionable, just to be safe. Check out Google’s link guidelines to ensure that you’re playing by the rules. Make sure that if you hire an SEO agency or consultant, that you’re fully aware of what they’re doing and that it won’t jeopardize your rankings. There are plenty of safe and effective ways to build links. Finally, remember that it’s been almost two years since the last Penguin update, so it’s very possible for sites to encounter a rankings drop due to Penguin. If you have any questions about Penguin 4.0, or anything else mentioned in this article, feel free to leave a comment below.